Maxwell has become so confident in riding his bike. In the fine weather we take the bike to the park. What an awesome little bike, Maxwell looks really happy. It is a fantastic bike. Maxwell loves riding his bike. Probably thinking how fast he can go ha ha. Maxwell is confident riding his bike. 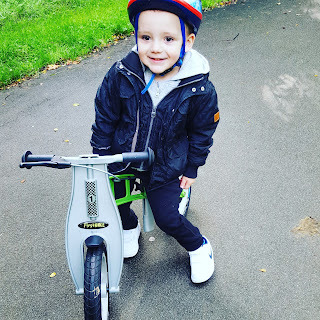 This is a FirstBIKE which is a new balance bike designed for children aged 2 to 5.